You shall love the L‑rd your G‑d with all your heart, with all your soul, and with all your might. And these words which I command you today shall be upon your heart. You shall teach them thoroughly to your children, and you shall speak of them when you sit in your house and when you walk on the road, when you lie down and when you rise. You shall bind them as a sign upon your hand, and they shall be for a reminder between your eyes. And you shall write them upon the doorposts of your house and upon your gates. And it will be, if you will diligently obey My commandments which I enjoin upon you this day, to love the L‑rd Your G‑d and to serve Him with all your heart and with all your soul, I will give rain for your land at the proper time, the early rain and the late rain, and you will gather in your grain, your wine and your oil. And I will give grass in your fields for your cattle, and you will eat and be sated. Take care lest your heart be lured away, and you turn astray and worship alien gods and bow down to them. For then the L‑rd's wrath will flare up against you, and He will close the heavens so that there will be no rain and the earth will not yield its produce, and you will swiftly perish from the good land which the L‑rd gives you. Therefore, place these words of Mine upon your heart and upon your soul, and bind them for a sign on your hand, and they shall be a reminder between your eyes. You shall teach them to your children, to speak of them when you sit in your house and when you walk on the road, when you lie down and when you rise. And you shall inscribe them on the doorposts of your house and on your gates-so that your days and the days of your children may be prolonged on the land which the L‑rd swore to your fathers to give to them for as long as the heavens are above the earth. These verses are the only inscription on the parchment scroll (except for one of G‑d’s names, Sha-dai, which is inscribed on the reverse side) and emphasize our belief in the oneness of G‑d. 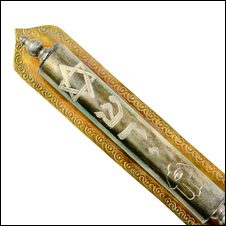 The Mezuzah scroll is made from handmade parchment from a kosher animal and inscribed in black ink with a special quill pen. 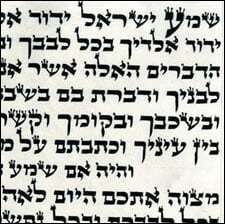 It is written by a specially trained, religious devout scribe, known in Hebrew as a sofer. The sofer concentrates intensely and writes with special Hebrew characters in a beautiful calligraphic hand. 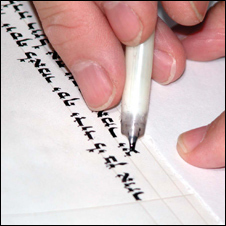 For more on the making of the mezuzah scroll, see The Scribal Art. The Mezuzah should be placed inside a protective case. The scroll should be rolled from left to right, so that G‑d’s name, “Sha-dai,” is facing the front. It is then placed right-side-up inside the case, with the Sha-dai in front. If you do not have a Mezuzah case, wrap the Mezuzah in thick paper or some other material. Mezuzahs are often acquired from the sofer or Judaica store already rolled and encased. It is important to make sure you obtain your Mezuzahs from a reliable source, so that you can be sure they have been placed properly. Sometimes, Mezuzah cases are sold fraudulently, with a photocopied paper scroll which does not fulfill the commandment, or even completely empty! There is so much variety when it comes to Mezuzah cases today, from plain plastic cases that cost a few dollars to artistically decorated cases in a range of precious materials. While it is a good thing to beautify any mitzvah, remember that the most important thing is to invest in the quality and “beauty” of the scroll inside. If it faces a bathroom. On a doorpost or archway inside a bedroom. On any doorpost or archway of a room where babies’ diapers are changed. Thanks for your reply! I was just wondering about the antique mezzuzahs I have seen online that do not have scrolls in them and was wondering what has happened to them. Do you think maybe they just disintegrated? why three and half years?